How do you know when the media is biased and pushing a knowingly false (fake) narrative? Disinformation campaign designed to buy ‘them’ more time by attempting to ‘con’ enough people in order to remove the duly elected POTUS in order to ‘save’ themselves from prosecution. #Breitbart ==> #DSMedia won’t cover the #Sen No #RussiaCollusion report! The propagandists push fabricated stories 2distract & buy time, in the public sphere, attempting to complete the original intent of the #insurancePolicy. FakeNews refuses to cover the Senates “no collusion” report relating to @realDonaldTrump. Why? To keep the narrative going to buy them enough time to attempt to impeach @POTUS. They won’t be able to. They would need 2/3rds of the Senate to impeach our @POTUS. How do you know FakeNews is totally in the bag for Democrats? How do you know they promulgate disinformation against @POTUS? They ignore the fact that: 1. US senate says no collusion; 2. US Senate opens investigation into Hussein collusion with Russia. Where’s FakeNews? Q shares scripture about how God is always faithful and will protect us from the evil one. 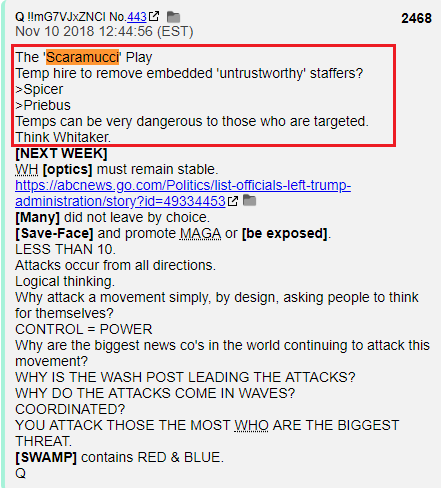 Anon speculates this drop not meant for us as much as possibly to reaffirm to someone (currently being controlled?) that Q will have his/her back & keep him/her safe from (((them))). Love some of the anon replies to Q’s scripture drop. Many “Amens” and well wishes for President Trump & Q team as well as some great memes I tossed together in this collage. 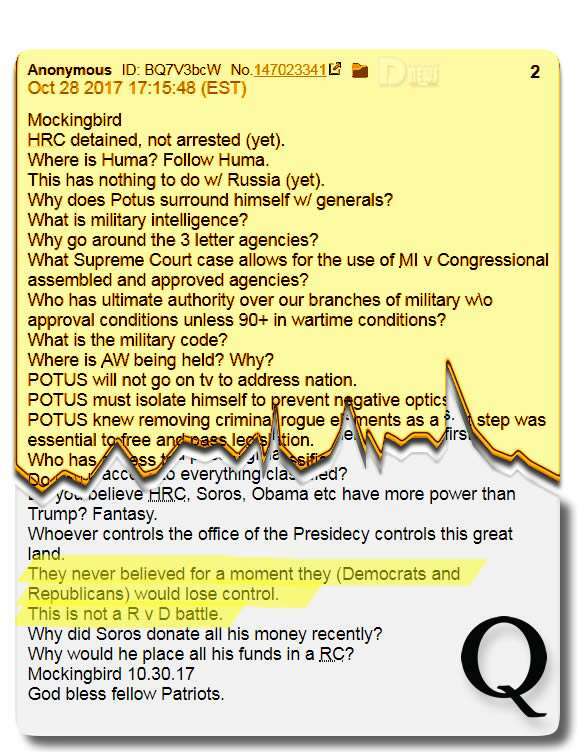 This #QDrop is meant to be read by each individual that comes upon it. When was Page removed from the investigation? #LisaPage was removed from the #SC on 15th July 2017. July 21, 2017, The #Mooch was appointed #WHCommunicationsDirector. He began work on 25th July 2017 & was fired on the 31st. It’s clear [5:5] that #Scaramucchi was a hired (& disposable) gun. #FactSheet link to #POTUS’ “Border Security Victory”. So all restrictions are off? An #Anon posts a screen cap of a portion of #POTUS’ statement on the contents of the #ConsolidatedAppropriationsAct2019 & asks if the statement means that the contained restrictions are all off. Trumps statement is brilliant Deep State loaded the bill with multiple facets to block it and his white house statement just released systemically points out section by section where they tried to block him and he’s countering that by citing presidential and constitutional authority. The Lord is leading Potus, of that I’m certain. #AnonFile says that they trust POTUs & believe he’s lead by providence. #Q responds in the affirmative; god leads us all in the battle between good & evil, the light vs. darkness. These phrases below imply that Trump plans on following his constitutional rights no matter what he signed iin the “Consolidated Appropriations Act, 2019” (the “Act”), which authorizes appropriations to fund the operation of a number of agencies in the Federal Government through September 30, 2019. Q posts link to AF veteran Thaddeus Dionne Alexander going off on liberal protesters. Video kept stopping so I found a Fox piece on this video he posted on FB shortly after the 2016 election. Link to @TeaBoots #Tweet ==> This man needs to be heard. #LoveIt or #LeaveIt! This entry was posted in Uncategorized and tagged Disclosure News Italia, Fe. 17, love, QAnon. Bookmark the permalink.